Yes, we offer laser engraving services for any of our rings. The cost is $30 for up to 30 characters. 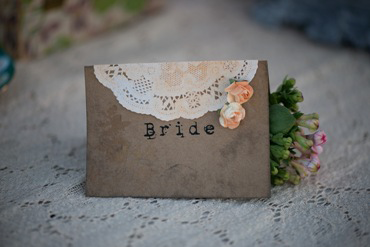 Traditional engraving is also available, however; it is not recommended. Laser engraving is a superior method because letters and symbols appear darker and bolder on the ring. Yes. The entire process should take less than 30 seconds to complete and emergency personnel are equipped to remove the ring for you. For greater details, see our About Tungsten page. Tungsten carbide can be cleaned with gentle soap and water. Special care must be taken for tungsten rings with inlays, specifically with sterling silver, because high levels of chlorine may tarnish precious metals. You may soak your tungsten carbide wedding bands for half an hour to an hour to soften especially caked in dirt that may have lodged into grooves. You may then dry your ring with a soft tissue or towel to restore it to its original shine. In normal wear, black tungsten wedding bands will only develop superficial scratches. These rings may be refinished in a number of ways. We offer refinishing services for your black tungsten carbide rings for a $20 fee. For refinishing services on your black tungsten carbide ring, please contact us. YES, you can wear a tungsten wedding band! Tungsten carbide is the most hypo allergenic metal available. Persons with very sensitive skin can wear tungsten without fear of irritation. Our manufacturers use a superior nickel binder to alloy with the tungsten. This is known not to irritate your skin. Take caution, some manufacturers use cobalt as their binding agent which may react with your skin, tarnish the ring and leave a brown/green mark on your finger. There are several mixtures of tungsten levels to produce a ring. In tungsten carbide, hardness is dictated by the oxygen content and the alloying binders. The ideal mixture is a percentage of tungsten at 89%, a nickel alloy at 10% and other carbon elements at 1%. We intentionally avoid less tungsten because this make the ring less durable and prone to scratching. Further, we intentionally avoid more tungsten because this will make the ring brittle and prone to shatter. This mixture was developed after 10 years of research and development by our manufacturers. Tungsten carbide is naturally a dark gun metal grey color. Black tungsten carbide rings are tungsten rings with a black coating. 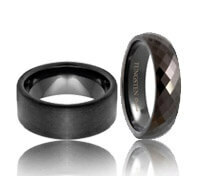 Our manufacturers produce a black titanium alloy and bond it a tungsten ring. This produces a highly durable black tungsten wedding ring. Both Tungsten and Titanium are known as alternative metals and are becoming quite popular in the jewelry market today. To make sure you choose the right metal, you should know what the differences between tungsten carbide and titanium. Tungsten carbide is a durable and heavy metal. Tungsten rings are four times harder than titanium rings. Although tungsten jewelry is not scratch proof, it is highly scratch resistant. It is so scratch resistant, only materials equal to the hardness of diamonds can leave a mark on your ring. This allows the ring to be permanently polished and maintain its shine forever. This is not true for titanium rings, where they can be scratched and turn dull over time. Tungsten jewelry will never rust, corrode or tarnish. Tungsten will not react to most chemicals. This allows it to be the most hypoallergenic metal available.